‘Palestinians’ and Turks go to France — to honor terrorists? 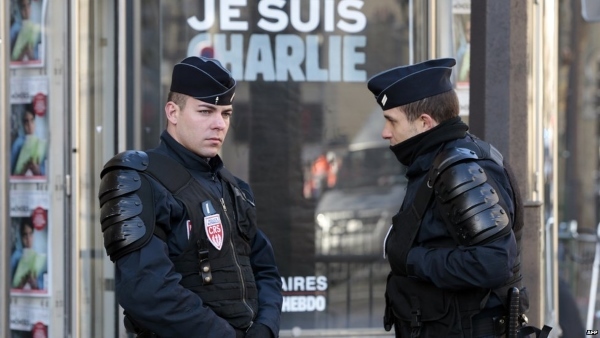 French police officers at rally site in Paris. BBC reports that about 2000 police and 1350 soldiers will be present for the massive rally that will be held today. Palestinian Authority President Mahmoud Abbas will attend a mass national rally in Paris on Sunday to pay tribute to the 17 victims of Islamist attacks there this week, including four people killed at a Jewish supermarket, a diplomatic source said. Abbas will be joined by many world leaders, including Israeli Prime Minister Benjamin Netanyahu, at the rally which is expected to draw more than a million people. The anti-terror rally Sunday afternoon is expected to draw some 30 world leaders, including British Prime Minister David Cameron, Jordan’s King Abdullah and Turkish prime Minister Ahmet Davutoglu. The hypocrisy, cynicism and sheer reality inversion that the ‘Palestinian’ leader is capable of is beyond belief, not to mention inducing nausea at a time like this. To whom will Abbas pay tribute? Certainly not the Charlie Hebdo victims, since there is no press freedom in the Palestinian Authority, where one can be jailed for ‘liking’ a Facebook post or insulting the President. And it’s unlikely that he wishes to honor the Jewish victims of the attack on the kosher market, because he regularly treats the terrorist murderers of Jews in Israel as heroes of the Palestinian movement and pays them generously. So he must be going to honor the dead terrorists. There’s simply no other possibility, unless of course he wants an opportunity to thank Hollande for his vote at the UN Security Council to trash previous UNSC (242, etc.) resolutions and international treaties (Oslo). That favor certainly improved Franco-Islamic relations, didn’t it, M. Hollande? It is also absurd that Turkey, which supports Hamas, provides sanctuary for its terrorist operatives (including the planner of the kidnap/murder of three Jewish teens in July), and may soon become the headquarters of its leader Khaled Meshaal, should pretend to show solidarity with terror victims. Turkey is also a difficult neighborhood for journalists, where dozens were harassed, assaulted or fired for coverage of anti-regime demonstrations or corruption. Abbas and Davutoglu will be in good company, though. The anti-Jewish French ‘comedian’ Dieudonné M’bala M’bala has announced that he, too, will be present. 2 Responses to ‘Palestinians’ and Turks go to France — to honor terrorists? It is a Sunday morning and many Americans may be propped up in bed watching the spectacle of the French gathered in central Paris to displace the dread that hovers over them with the bonhomie born of shared tragedy. It is the same good-feeling moment that was supposed to be churned out by the first crowds in Tahrir square, who impelled Morsi to the Presidency, only to regret that decision and later mass in even larger numbers to expel him. The media are only too happy to render these moments out for us, a sort of political Olympics, a somber version of a Tour de France wrap-up. France will be losing its Jews again. This time not to be rounded up and turned over to the SS by Vichy collaborators, but by the sheer weight of a national decision that has made a commitment to making its Muslim immigrants feel comfortable in Europe’s heart. Perhaps the man or woman on the street knows that this special moment will be very difficult to carry over to daily life. It is, after all, entirely understandable that so many French non-Muslim people who know so many French Muslims in their land with whom they have had nothing but reasonable contacts, do not have the desire or the will to browbeat them about the jihadist element they harbor, to excoriate them about the no-go zones that stipple the land of France, to overturn the laws that favor instruction about Islam and limit free speech, to take them to task about the strength of anti-Semitism within their group, nor to look inward and take stock of how France’s elites betray Jews in France and in Israel. This is a heavy burden of self-examination that few nations can begin unless forced to the task. Germany was forced to deal with its past. Japan. You lose a war, you can be forced to take stock. But it’s hard to do. France is losing a war and when France loses its Jews this time, it will have bigger problems and no one else to blame. Bernard Henri Levy remarked just now, with passion, that the French wondered if Muslims would turn out for this day, for this special moment. And they did. That might be an encouraging thing, the sort that instills fraternite. Perhaps it’s a sign of my own cynicism that I don’t put much faith in such a public display. I want to feel good too about the direction of the West, the sensibility of it citizens overpowering its leaders, to believe there is a will amongst Muslims to wrest their beliefs from their most violent factions. These are to be proven. The real work will be on the French after the Jews leave. And they have to leave, because the episodic nature of the dispassionate violence they experience, soon followed by public commiseration leads a rational man to believe that leaving is best when guilty feelings are highest. The last 40 years have not shown them that the violence stops after the remorse. The Paris rally was a combination event. The mourning of the victims was eclipsed by the diplomatic maneuvers of our enemies. It was another media event like inviting Arafat (Yamach Shmo) to address the UN….and he wore a pistol holster. Now, after the Paris event, prudence demands not to make any adverse comment in re the barbarians or ther “religion”. The council of Franz Kafka and Saul Bellow doesn’t work if we don’t listen and look at events.